Abstract expressionism is an exciting style, quite literally: as you might guess from the'expressionism' aspect of the name, being most frequently characterized by a unique degree of physical interaction between artist and canvas. The shapes are bold and kinetic, and the colour palettes and scale of the pieces tend to bear out this initial sensation. Jackson Pollock, who we recently reviewed in our Artist Spotlight segment, is probably the most famous artist in the movement, but it had called a number of famous artists its own during its day, including Arshille Gorky, Hans Hofmann (whose painting 'The Gate' is shown to the right) and John Graham. Abstract expressionism is one of the most visually intriguing movements to develop in the art world during the 19th century, but it has even more to its credit than beauty for the role it played in the dynamics of the art world. Before the advent of the movement in the 1940s, Paris had been widely regarded as the central hub of the Western art world. North America was regarded as something of a cultural backwater, an upstart colonial society that was still hadn't earned its creative chops. With the advent of abstract expressionism in the United States, suddenly the hottest place on the planet to be an artist was New York City, and Paris was forced by general acclaim to cede the crown (although there are no doubt still some die-hards who would place Paris above NYC, notably most Parisians). Primarily, abstract expressionism in the painting world is broken up into two major styles, although naturally they can't cover all possible interactions of the movement, which also lent themselves well towards sculpture, thanks to the kinesthetic natural of the act of sculpting. In painting, however, the two major styles are generally recognized as action painting, which Jackson Pollock was famous for, and colour field painting, which is exemplified in the work of Hans Hoffman. Action painting more or less does what it says on the tin, and is remarkably enjoyable to do, although difficult to do well. As Pollock said, "My painting does not come from the easel. I prefer to tack the unstretched canvas to the hard wall or the floor. I need the resistance of a hard surface. On the floor I am more at ease. I feel nearer, more part of the painting, since this way I can walk around it, work from the four sides and literally be in the painting." 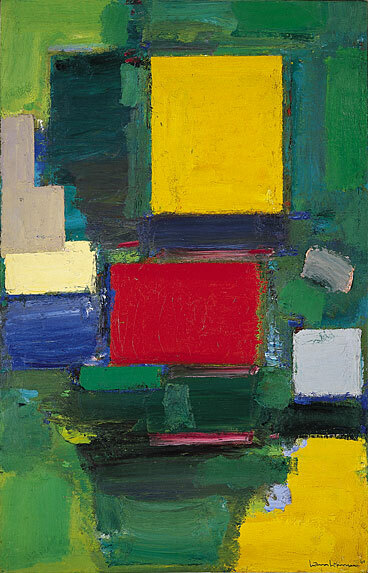 By contrast, colour field painting tends to be more deliberate, and relies on the emotional reactions produced by large, bold shapes.